Dr. Duff served as the first president of the University of Massachusetts Lowell, one of his many academic roles. John B. Duff took a measured approach in 1981 when he was named the first Massachusetts chancellor of higher education, and for good reason. He had served on a selection panel that settled on four finalists for the position, Dr. Duff not among them. When the committee could not agree on which candidate to pick, he emerged as a chancellor-designee upon whom consensus could be reached. It was not the first time Dr. Duff was the first to serve in a job as an educator and administrator and would not be his last. At the time he was named the Commonwealth’s first higher education chancellor, he was serving as the first president of the University of Massachusetts Lowell. Nearly five years later, he left the chancellor’s job to become the first nonlibrarian to lead the Chicago Public Library system. A historian by academic training who made history himself during his lengthy career in New Jersey, Massachusetts, and Illinois, Dr. Duff died of complications from Alzheimer’s disease Oct. 1 while in hospice care. He was 82 and lived in Palm Desert, Calif.
After serving as head of the Chicago libraries and overseeing construction of the Harold Washington Library Center, which has been recognized as the largest public library building in the world, Dr. Duff returned to campus life as president of Columbia College Chicago, from which he retired in 2000. The string of high-profile leadership posts brought him a great distance that could not be measured in miles alone from his childhood in a working-class family in Orange, N.J.
As the state’s first higher education chancellor, Dr. Duff encountered political difficulties that contributed to his decision to leave. His $65,000 salary was less than the $90,000 paid to the University of Massachusetts president, an underling of the chancellor, and legislative attempts to increase Dr. Duff’s pay faltered. 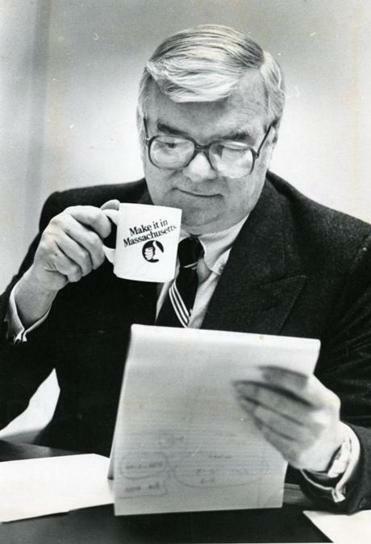 Then in October 1985, his public information director, Estelle Shanley, sent a letter on the chancellor’s stationery to members of the Board of Regents asking each to buy a $100 ticket to a December fund-raiser for the House speaker, George Keverian, and make out the checks in Dr. Duff’s name. Under state law, state employees except for elected officials were prohibited from directly or indirectly soliciting political contributions. Governor Michael S. Dukakis asked for an investigation into the matter. Several weeks later, on Dec. 30, he took over as commissioner of the Chicago libraries. Born in South Orange, N.J., to John Duff Sr. and the former Mary Cunningham, John Bernard Duff Jr. was the oldest of four brothers. His mother had emigrated alone at 18 from Galway, Ireland. Along with his scholarly publications about the Civil War and Reconstruction, Dr. Duff would later write about Irish immigrants in the United States. He graduated from Our Lady of the Valley High School in Orange, N.J., and studied history as an undergraduate and graduate student, receiving a bachelor’s degree from Fordham University in the Bronx, N.Y., a master’s from Seton Hall University in South Orange, and a doctorate from Columbia University in New York City. In October 1955, he married Helen Dorothy Mezzanotti, with whom he had six children. Their marriage ended in divorce after 33 years. Dr. Duff later married Shanley, with whom he lived in California after retiring from Columbia College Chicago. He taught history at Seton Hall and was unsuccessful in a bid to be elected to New Jersey’s 12th Congressional District. Moving into administration at the university, he rose to become executive vice president and provost. In 1976, he was chosen to be the first president of UMass Lowell. While in Lowell, Dr. Duff also was elected to lead the newly formed Lowell Historic Preservation Commission, which helped develop the Lowell National Historical Park. US Representative Danny K. Davis, an Illinois Democrat, entered a tribute to Dr. Duff into the Congressional Record upon his retirement as president of Columbia College Chicago. In addition to his wife, daughter, and former wife, Dr. Duff leaves three sons, Michael of Canton, John of Morristown, N.J., and Robert of Olympia, Wash.; two other daughters, Patricia Duff Bernacki of Whidbey Island, Wash., and Emily of Quincy; eight grandchildren; and three stepdaughters, Janet Shanley, Patricia Doherty, and Teresa Shanley. Dr. Duff’s children are planning a memorial service, which will be announced. Throughout his life, Dr. Duff “was a voracious reader and always had a book in his hand. He wanted to know about all kinds of things,” his daughter said.